Last year, Amy and I spent a very enjoyable long weekend with her cousin and cousin’s husband visiting the Napa and Russian River Valley winelands. Throughout the course of the weekend we must have tasted fifty different wines at twelve or so different wineries, and I am slightly embarrassed to admit that I did not spit so much as one drop. After our second full day of tasting we were all overwhelmed by the urge to continue our bacchanalia that evening with a four course dinner and more wine. Heated discussions were had over what should be on the menu and what we could reasonably cook given that we’d been drinking all day and the kitchen in our cabin was less than professional-grade. Finally, we decided that a variety of cold appetizers, including hummus, guacamole, crudite, and pita chips, would be an easy way to begin and might allow us to cook the rest of the meal without getting too drunk. The second course was gnocchi with a combination of two Lidia Bastianich sauce recipes – one with breadcrumbs fried in butter, and the other with sage and brown butter. The sauce, of course, was about as easy as a sauce can be, but the process was lengthened by us making the gnocchi from scratch. The third course was a delicious New York Strip steak served with a red wine jus and roasted red and golden beets. And all of this was topped off with a final cheese course of a California goat brie, a morbier and an honest hunk of manchego — naturally all washed down through purple lips with some more red wine. Now, the point of this tale is not to wow our readers with how much we drink when we’re with Amy’s cousins, because we often surprise ourselves by that, but rather it is to demonstrate that you can make really, really good gnocchi di patate from scratch even when you’re half in the bag — though we recommend you make it when sober for the first time. – 1 large pot of boiling water or enough to boil the potatoes in and then the gnocchi. 2. Peel and chop potatoes, and boil them until they no longer stick to a knife-blade. Remove potatoes from water, but not discard it. Drain potatoes and let stand until cool enough to handle. 3. Use a food-mill, food processor or, better yet, the fine grater side of a box grater, to grate potatoes. 4. Spread grated potatoes out on a baking sheet and sprinkle with remaining salt to draw out some of the moisture. Leave for 20 minutes. 5. Sprinkle flour on a board and place grated potatoes on it. Make a well in the middle and crack egg into it. Add half a cup of flour and combine it all by hand. 6. Mixture should be quite sticky so continue adding flour and combining until it gets smoother. You’ll know it’s the right consistency when it stops being sticky and, if you cut into it, it resembles cookie dough. Don’t worry about getting it really smooth because the potatoes won’t combine perfectly with the flour, it’ll always have a kind of speckled look. 7. Cut dough into three or four lumps. Re-flour your board and hand roll each of the lumps into a long sausage, about the width of a large hot dog, I suppose. Then take your knife and cut the roll into inch-long lumps. These are your gnocchi. 8. 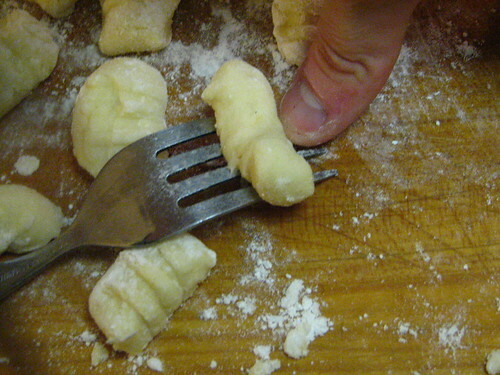 Then take a fork and press/roll the gnocchi down the tines of the fork, making grooves to better hold the sauce. 9. Re-boil the water and cook gnocchi in batches. You know they’re done when they float to the surface. 10. Serve with your favorite sauce (Amy’s Tomato Sauce, Pistachio Sauce, Pesto or Brown Butter and Breadcrumbs – see below). Melt butter in saute pan on medium. When it begins to color, add your grated breadcrumbs. You will be crisping up your breadcrumbs, but watch your heat because you do not want to burn your butter. After 1 1/2 minutes, add the sage. Allow to flavor the butter for another minute. Season with salt and pepper. Toss sauce with your gnocchi. Plate and sprinkle with grated Parmigiano Reggiano. DELIZIOSO! look at that! they do look so very pillowing, i love lydia too. her food reminds me of my noni. just beautiful gnocchi! Gnocchi is on my long list of things to make. Great photos…now exactly how long did it take you to make all that? Hmmm… those gnocchi’s took about 45 minutes to 1 hour total (including mixing the dough, letting it sit w/ the salt, cutting and shaping). 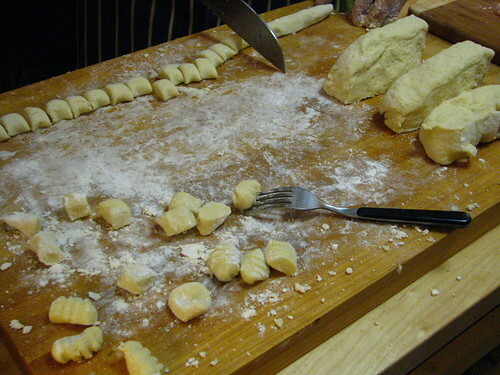 It looks like it would be a pain in the a$$ to shape each gnocchi individually, but if you aren’t a perfectionist (which, in my opinion and experience making homemade pasta, you can’t be!) then you’ll be fine. Do it with a friend or your husband and it goes even more quickly. Really, give it a try. All you need is your hand, no machines required! We’ve done it with whole wheat flour before, but they don’t taste as delicious. Thanks, Pixie and Aria! PS: OH, and Aria… have you ever been able to see Lidia’s real Noni (ok, it’s her kids Noni, but you know what I mean…lidia actually calls her Noni on the show)… she is a TOTAL poosh (word i use to mean cut -human or animal). She is like the quintessential noni – she looked like mine and she probably looks like yours! There’s pics of her in her cookbooks too. I just love gnocchi, but I always have it with either a Napoletana or Gorgonzola cheese sauce. The breadcrumb sauce sounds delicious. A beautiful post. Hey! Great you post about gnocchi!!! I’m bookmarking this one 😀 I would love to make my own some day. Thanks!!! I love making it in the summer with diced fresh tomatoes and herbs, and just a drizzle of good olive oil and some S&P. I’m thinking of using roasted celeriac or some parsnips in the dough for spring. Yum! call me crazy, but this sounds like the perfect food project for me the four year old while my wife’s away in NYC for the next few days. Thanks for making a dish that had intimidated me seem so. . . approachable. I think you’re in for some fun (or at least the kid is since I’m sure you’ll be the one doing the clean up! Let us know how it goes. I think this is the perfect meal to make w/ a child. Just don’t let him smear dough on the walls. i think i found dinner. Pingback: Gnocchi – We Are Never Full - This Cat Can Cook! Marilyn – thanks so much for trying our recipe! Your sauces sound awesome and congratulations on a great Christmas meal! I feel like cooking always goes that little bit more smoothly when you’ve been drinking, or maybe it just feels that way! ← Does Hollywood Hate Food?